Explanation: It was mealtime in galaxy cluster Abell 3827. 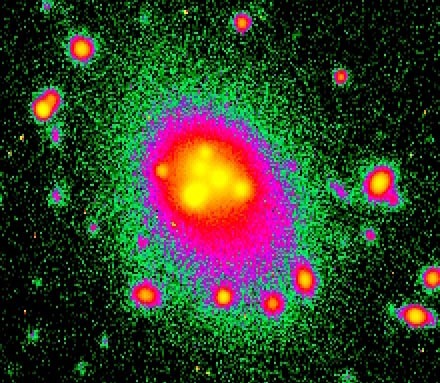 The hungry cluster dominant galaxy in A3827's center is seen being fed. Breakfast included five smaller galaxies unfortunate enough to wander too close to the cluster's central supergiant galaxy. 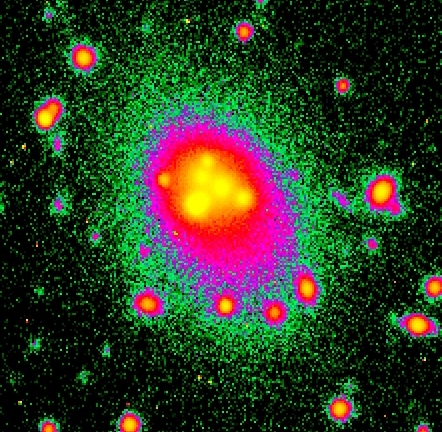 The remnants of these five galaxies can be seen in the center of this false-color picture. A single massive galaxy dominates the centers of many compact clusters of galaxies. A3827 is so distant, having a redshift of 0.1, that light takes about 1.5 billion years to get here from there. We are therefore seeing this cluster only as it existed 1.5 billion years ago, so that these five galaxies are probably by now all digested into the huge cluster center.